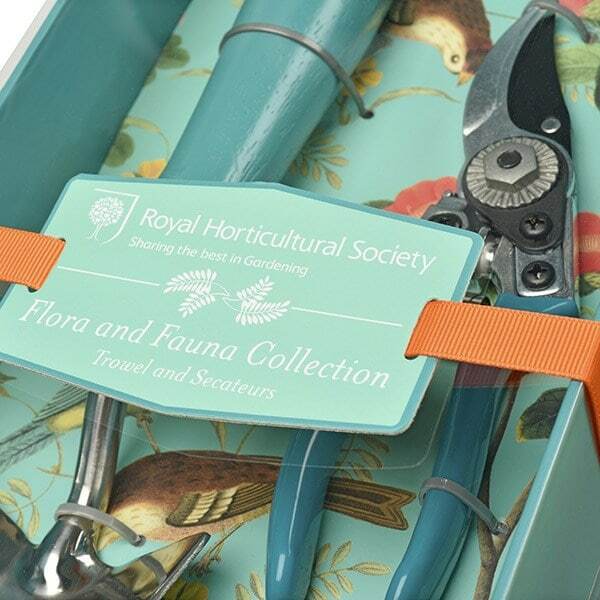 Beautiful RHS trowel and secateurs set, presented in a decorative bird print box tied with orange grosgrain ribbon. The secateurs have strong high-carbon steel blades with coloured comfort-grip handles to protect hands and wrists. The trowel has an FSC-certified hardwood handle and a carbon steel blade engraved with the Gertrude Jekyll quote "The love of gardening is a seed once sown that never dies”.